Congrats & welcome to the forum! Welcome to the forun Chari! Official drop test 10 feet onto concrete. Result NO screen damage. Of coarse case scuff marks, but no case cracks. Phone is tuffer than it looks. But I was drying out my basement floor (which was pretty much dry), phone rang, bumped the shelf I had my phone, and it fell about 2 1/2 to 3 feet and the screen shattered. Must have hit the sweet spot. Because I've dropped it out of my car about 5 times and no damage. But this once... LMAO Everything has that "sweet spot." Even Gorilla Glass. Shattered that once, too. LOL! Ouch man!! Thats not good! bhuber09! whats up man! 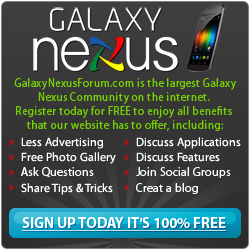 i aint kno u had a nexus, i kno u from the other forum! anyway i got a nexus now, jus rooted it, flashed trinity kernal (1728, 537 gpu) and JBSourcery 5.4 encore rom yesterday. good choices? or is there something better? ?